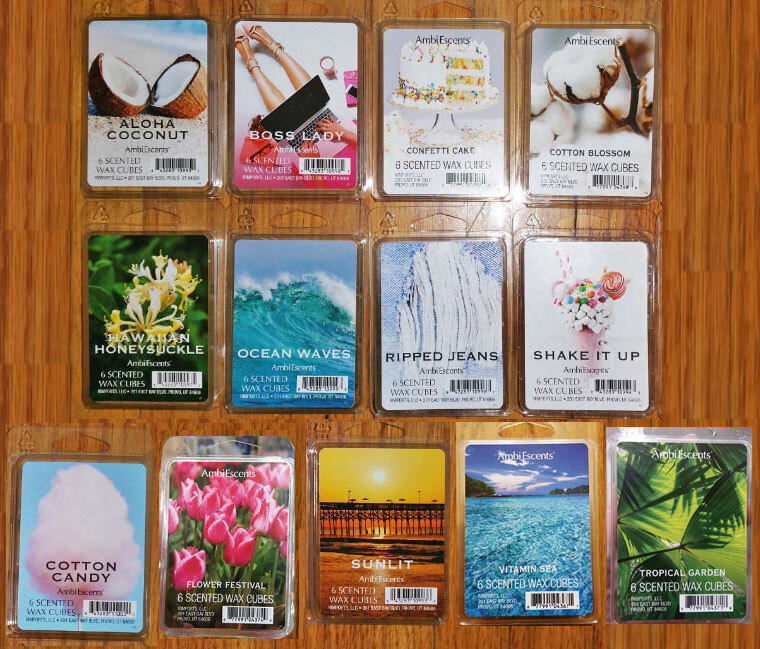 Read reviews of AmbiEscents Wax Melts from Bed Bath & Beyond (Spring 2019). Disappointly, all of these except 1 or 2 are dupes of ScentSationals or Better Homes and Gardens scents (AmbiEscents melts are made by ScentSationals). At $2.99 each, it doesn't make sense to buy them unless you can't find the original scent at your local Walmart (where they cost $2.00). This is the same scent as ScentSationals Coconut Vacay (which smells almost exactly like Better Homes & Gardens Island Coconut Lime, but with mostly lime and just a hint of coconut, and without the slightly soapy note that Island Coconut Lime has). The scent notes are totally wrong, as this is a coconut scent with a strong lime note, and no vanilla, cake, or buttercream notes. Actually, sniffing them side by side, they "might" be very slightly different. Aloha Coconut seems to be MORE limey than Coconut Vacay (although not as limey and sweet as Mainstays Coconut Lime). This is the same scent as ScentSationals Girlfriend Night. This is the same scent as AmbiEscents Sugar Cookies, a nice sweet vanilla scent with a buttercream note (slightly different scent from ScentSationals Vanilla Bean, not as milky, and with a little bit of a cookie note). In fact, my store receipt says "Sugar Cookie"! Fantastic laundry scent. It's definitely a dupe of another ScentSationals or Better Homes & Gardens scent, because I've smelled it several times before. It smells more like laundry detergent than a powdery fabric softener (or might be a mix of both), but it's also not a harsh detergent scent like Better Homes & Gardens Line Dried Linen. Notes: The ultimate sweet spun sugar confection! A blend of fresh peach nectar with subtle undertones of shredded coconut and pink lady apple topped with a hint of lemon and wrapped in chiffon musk. This is the same scent as ScentSationals Cotton Candy Cloud. This is not a floral scent at all. In fact, I think it's the same scent as last year's Better Homes & Gardens Pineapple Melon Freeze, which was a dupe of an older ScentSationals scent called Tropical Fiesta. It's a waxy, slightly sour tropical scent with a cantaloupe note, and maybe a bit of pineapple, but it's not sweet at all. I don't care for it. This is the same scent as ScentSationals Honeysuckle Pineapple. This is the same scent as ScentSationals Ocean Tides, AmbiEscents Maui Beach (not to be confused with ScentSationals Maui Beach Waves, which is a different scent), and ScentSationals Calypso Sands. It's fantastic! This is a laundry scent, but it's different from Cotton Blossom, which is kind of cross between laundry detergent and fabric softener. This scent smells more like musk, gardenia, and a smidgen of rose, with a little bit of a fresh laundry/fabric softener note. Despite the Egyptian cotton note in this scent, it's a different scent from ScentSationals Egyptian Cotton. And despite the florals and musk, it's not a super sweet perfumey scent, because of the laundry note. I haven't smelled this one before, so I don't know if it's a dupe of another scent. Okay, the notes are exactly the same as ScentSationals Laundry Basket, which I no longer have. But I do have AmbiEscents Laundry Basket and I sniffed them side by side and they're totally different scents. But AmbiEscents Laundry Basket and ScentSationals Laundry Basket may be different scents. Someone said they think it's the same scent as ScentSationals Linen Closet, which I've never seen but I think it's either a Canadian or Meijer stores exclusive. This is the same scent as ScentSationals Unicorn Cake. This is the same scent as ScentSationals Celebration Time, although the scent notes for Celebration Time are, "A sweet citrus blend accented by soft greens, fresh berries, ginger sparkle with hints of white jasmine, cala lily, white woods and golden amber finished with candied vanilla and toasted sugar". I just sniffed them side by side. It's a warm ambery super sweet perfumey pear nectar scent, and it's fantastic. Join our Facebook Group to discuss U.S. store bought & retail wax melts. Are you a wax melt company (retail, vendor, or sales rep)? Our FREE Review & Promotion Service can help you get more customers. © Copyright Scented Wax Melt Reviews.